Mega Yacht Design – Superyachts News, Luxury Yachts, Charter & Yachts for Sale. Them main target of the design is to create more comfort in the luxury. The VIP cabins are specially designed for the private dining areas with own perminant balcony. The cabins are also surrounded with panaromic windows from interior as well. 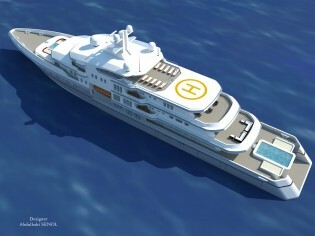 The design includes very special master cabin for the owner. The master cabin has unordinary spacing with 3.2m open heihgt in the area. The jacuzzi and sunbathing area are specially design for owner privacy. The other common features of the mega yacht level project are placed in high luxury boat as gym, swimming pool, cinema room, etc..